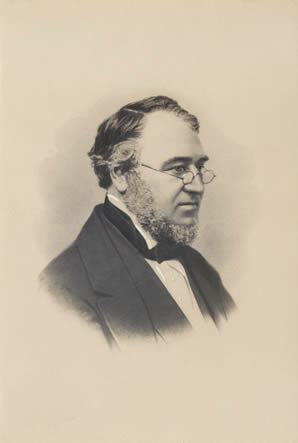 Born in London and educated at Christ’s Hospital, Hollings came to Leicester in 1837 as the second master and a tutor in science and Latin at the new Proprietary School (now New Walk Museum). In 1846 he was promoted to Headmaster, but within a year the school had failed and was closed. J.F. Hollings wrote prolifically on the town’s history; he produced a definitive Paper on the Civil War in Leicester, extensively researched the town’s Roman history, and gave weekly public lectures on many diverse topics. Hollings married Sarah Biggs, apparently after she had submitted to his experiments in mesmerism! Well-educated in Greek, she was sister to the highly influential Leicester manufacturers and politicians, John and William Biggs. As editor of the Leicestershire Mercury Hollings gave eloquent support to the political ambitions of his brothers-in-law and in 1857 was elected a Councillor to John Biggs’ old seat of St Margaret’s Ward. Hollings was buried in Welford Road cemetery in the grave of John Biggs, and a fine Gothic column public memorial was erected to him in the New Walk Museum grounds. Most of The Club were on the committee supervising its design and erection, and its Latin inscription was composed by Franklin, though Caillard and Mott insisted on some words in English too – for future generations and foreigners who might be ignorant of Latin. In 1955 the Hollings memorial was considered unsafe and instructions were given for its demolition. Source: Caroline Wessel, 2010. The Club. pp.85-96 in Exchanging Ideas Dispassionately and without Animosity (Leicester), See also Roger Evans, The Biggs Family of Leicester. Trans. Leicestershire Archaeological and Historical Society, vol. 48, 1972/3, pp. 29 – 58. Evans, R., 1972/3. The Biggs Family of Leicester. Trans. LAHS, vol. 48, pp. 29 – 58.